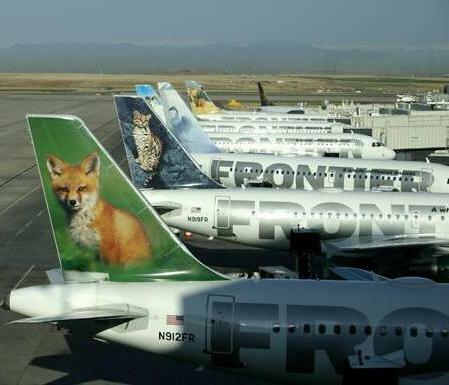 May 13, 2010 - Frontier Airlines, a wholly owned subsidiary of Republic Airways Holdings, Inc. announced on Wednesday that customers can now travel with their small, furry friends in the cabin of the aircraft for a $75 each-way pet fare. The new in-cabin pet policy applies to small dogs, cats, rabbits, guinea pigs, hamsters or small household birds. All pets must fit into a carrier that fits under the airplane seat and they must have proper health documentation in order to fly. In addition to allowing small pets in the cabin, Frontier also accommodates larger pets as checked baggage. Pets weighing more than 20 pounds, who do not fit the pets-in-cabin requirements, may be checked for a $150 fee. Frontier Airlines is a wholly owned subsidiary of Republic Airways Holdings, Inc., an airline holding company that owns Chautauqua Airlines, Lynx Aviation, Midwest Airlines, Republic Airlines and Shuttle America. Currently in its 16th year of operations, Frontier employs more than 5,500 aviation professionals and operates more than 550 daily flights from its three hubs at Denver International Airport, Milwaukee’s General Mitchell International Airport and Kansas City International Airport. Frontier offers routes to more than 70 destinations in the United States, Mexico and Costa Rica.